It has to be said after all the emotions have died down, that Charlie Hebdo has been a newspaper hated by every Government as well as the Church, Mosque, and Synagogue. I rarely ever bought it myself, but would read it with fascination when I had to wait around the garage for my car to be finished. It was a sort of visual delight found among the usually boring variety of weeklies on a doctor's waiting room table. But it has what the French call 'une gueule' which is to say a 'strong character'. Fantastic graphics, as one can see from these covers. And wit! What deliciously disturbed interrogations aimed at below our bourgeois belts! In America, it would have been firebombed years ago by radical Christian fundamentalists,.. or right wing Zionists,.. or Islamists... Somebody like Timothy McVeigh for sure. As we know, many of us living abroad, Americans don't like this sort of ironic humor, c'est franchement trop! 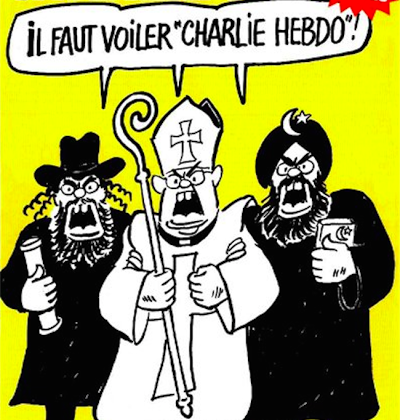 Charlie Hebdo clearly hated the hypocrisies of religious hierarchy, any religion in fact, and for that, I love them. But they are a French invention, and I cannot believe that they would have been tolerated in more Anglican-Christian cultures like the USA or Australia. Their humor goes back to Moliere after all. And, here in Australia, which recently endured its own brush with a kind of political terrorism, one which more closely resembled a fringe lunatic than a trained warrior from Yemen but a murderer nonetheless. And yet, I cannot imagine that Australia would have permitted, nor accepted Charlie Hebdo here any more than in America. Here, Political Correctness grows like weeds. And, it often drives away any engagement with the dirty, visceral windows through which we still need to look into in order to find the elusive truth separating 'Them from Us', 'Us from Them', whatever these things really are. As a progressive society (as Australia certainly is) many offensive ideas (to some) are still barred from real public discourse. We need to be careful not to hide behind the 'cliché' of free speech while most of us secretly still reserve such politically-correct notions of what we deem appropriate or not in the public domain. What might be hurtful to some or simply funny to others. After all, what others think of me isn't my problem, its their problem. And, ultimately, it is only what I think of me which counts. The late editors of Charlie Hebdo would have really hated this sort of political correctness. So, yes, maybe 'Je suis Charlie' but maybe not, too. Tony Abbott, the Prime Minister, said the other night on television that he 'approved' of the newest cover (out with much fanfare) in France the other day showing Prophet Muhammad, with tears in his eyes, weeping. The caption above read: "Tout est pardonné"
(all is forgiven). The irony of this new cover went completely by the Prime Minister who seemed to take it literally, Ha Ha.